The Major Taylor Cross Cup is held just down the road from Marian University. 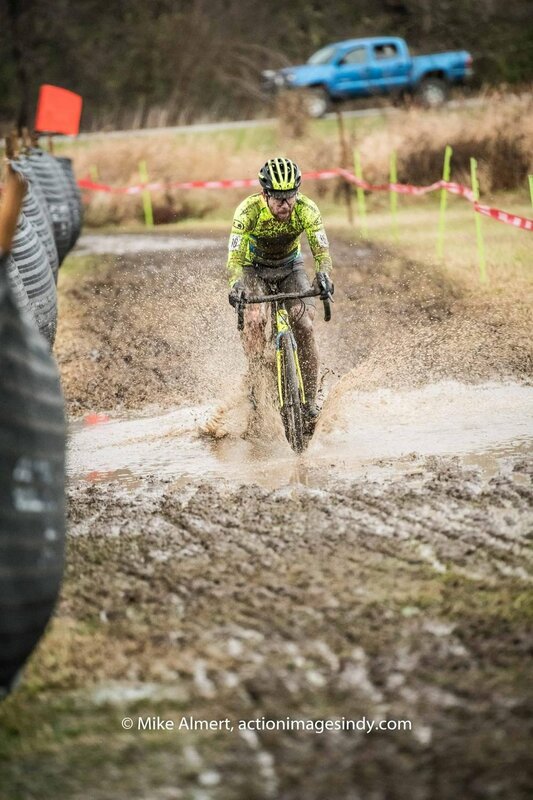 This second year UCI event had epic conditions in 2016, and if the forecast held true, the 2017 edition was going to be just as gnarly! The week after the Cyntergy Hurtland race flew by. I had a few days to rest and recover, with a couple of hard workouts before racing at the weekend. I had finished one of said hard workouts and was feeling pretty good about starting the day off successfully. As I rolled home down the Katy Trail, I approached one of the many intersections along the way home and paid little notice to my immediate surroundings. In my moment of inattention, I managed to (pretty fantastically) run into a metal post. Somehow I landed on my feet but I managed to bash my right hand against the shifter and bruise my thumb in the process. At this point, I'm still not sure if it's broken or not, but it definitely made for a few painful days leading up to the race in Indianapolis. I woke up in Indianapolis on Friday morning and rolled to get some coffee with my friends Hugo and Zach. It was a good chance to catch up with the kids and see how life at Marian University was treating them. After plenty of caffeine and some work, it was time to pre-ride the course on the grounds of the Indy Cycloplex just up the road from Marian. The course uses almost all of the grounds that surround the cycling complex, which includes a velodrome, BMX track, skate park, and even some single track trails. The track was one of the most balanced courses I've ever ridden, with lots of sections of pedaling and some technical descents and off-cambers to keep you on your toes. I didn't push the pace too much on account of some thumb issues, but took enough laps to get the turns down. Furthermore, overnight rain was in the forecast which would render my pre-ride mostly useless. As the day broke on Saturday, the rain was still pelting against the windows of our host house. While the weather looked miserable, it was still relatively warm, which was the only saving grace. The rain didn't let up and came through in bands between and during the early races. On these rainy days, it's really difficult to pre-ride. 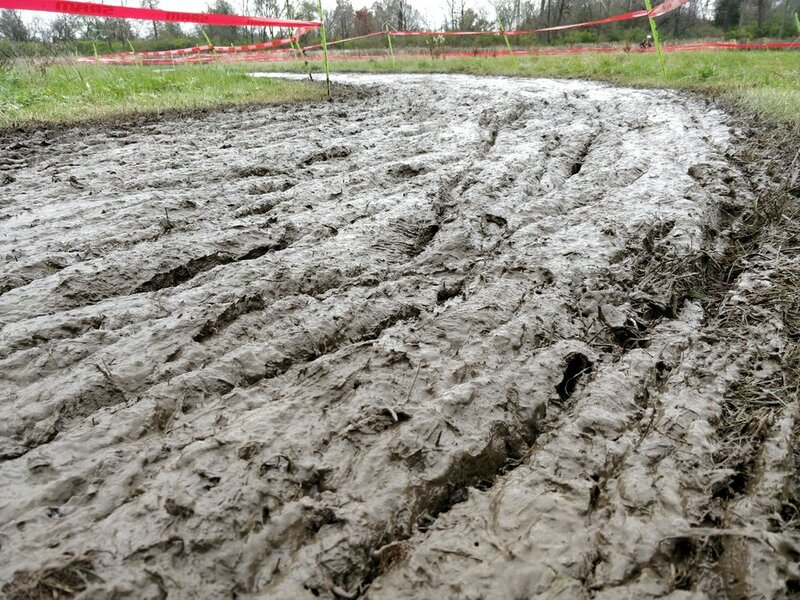 For one, it's mentally challenging to get motivated to kit up and run headlong into the mud. Moreover, the clean up afterwards is just as taxing. Where the top cyclocrossers have a mechanic that will wash and tune their equipment, privateers and other less supported riders are left to stand line for the power washer and do their own wrenching. We all start somewhere, but having that time to rest and recover would definitely be an advantage. Whining aside, I got a short pre-ride in to check the conditions and get tire pressure dialed. Bike washed, I parked myself in the car as the next band of storms came through. The rain and lightning would not relent and it got to the point that we began to question whether the race would actually go off. As a rule and safety precaution, the officials delayed the start of the UCI Junior race by 30 minutes each time there was a lightning strike. After 90 minutes of delays the UCI Junior and Elite Women eventually got started at 3:30p. The Elite Men eventually got their call to staging. We waited as the temperatures started to drop and light began to fade. The whistle blew and it was pedal to the medal into the mud. The day's rain created boggy conditions. 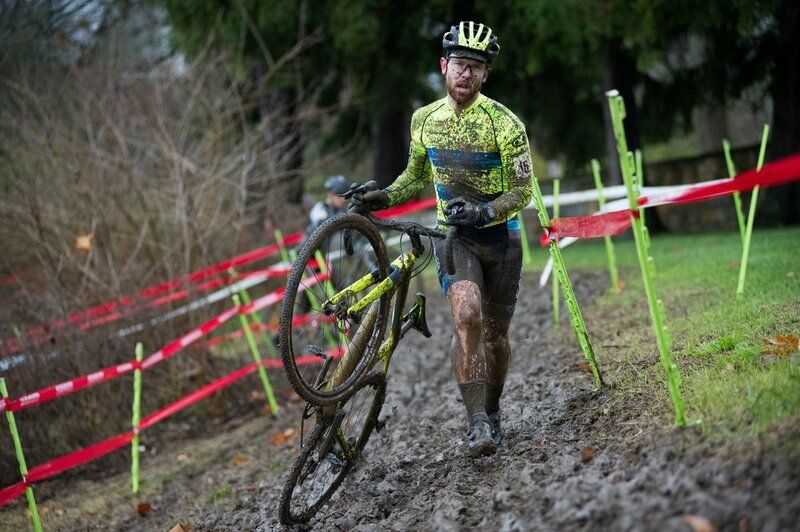 As the group hit the mud, it was slow churning pedaling as riders wove all over the course trying to find some kind of grip. I did my best to get through the scrum and emerged just off the back of the group riding for the top 10. As we hit the hill for the first time, there was no chance of riding and we dismounted our steeds to sprint uphill. The rest of the lap was a blur, but there was lots of mud and water. The slip 'n slide conditions were epic. It was also particularly difficult to ride fast and it became a race of who could hit the deck the fewest times. I was able to pilot my bike around the course with some deft touch for a few laps. Yet as the race wore on, the conditions also took a toll on my equipment. The pads started to wear out and constant mud began to pick up on the bike. I found my way into the tape down the Mindick Moguls and began to make a few mistakes here and there. Try as I may, the motor wasn't big enough to put me farther in the mix and I finished the race one lap down in 18th place. Cold, wet and muddy, I had no issues and made my way to the heated interior of the car. We woke up on Sunday to much brighter skies and no rain in the forecast. While there was no additional moisture falling from the skies, the remnants of Saturday's storms were apparent all over the grounds. Moreover, the temperature had dropped about 20 degrees from the day before. The track itself remained mostly unchanged as well and the course was a tale of two tracks. The hilly side of the course was still slippery and the mud starting to tack up in the blustery conditions. 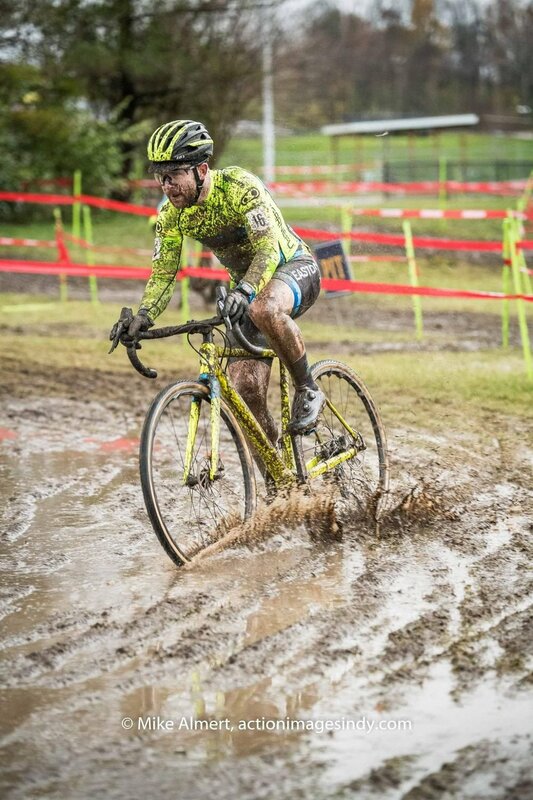 The low side of the course was more swamp than cyclocross course, with several deep puddles covering any remnants of green grass. Not wanting to deal with the inevitable cleanup, I chose to pre-ride the dryer side of the course and keep my equipment as clean as possible. This was the only grass patch available. I was able to get a better warm up today and go to the line with some semblance of preparedness. Poised and ready to go, I actually missed my pedal off the line and struggled to get back on terms at the start. 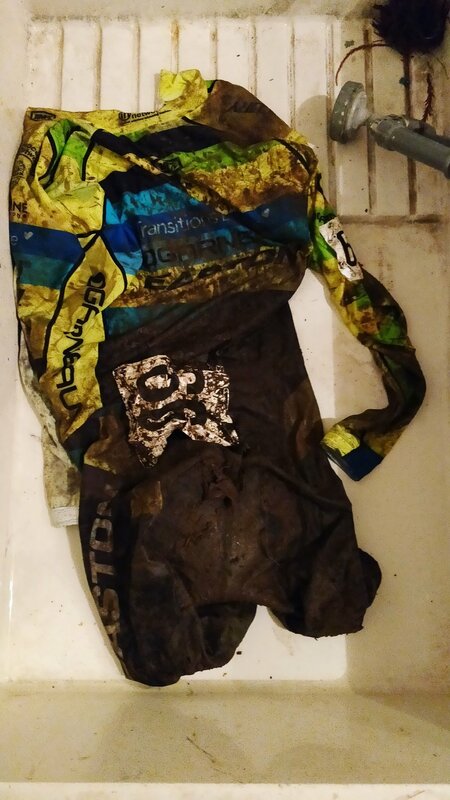 As we entered the swamp on the first lap, I quickly dismounted my bike and was able to make up the ground that I lost running with my bike on the shoulder. In fact, Sunday's race was more of a running race than a bike race. 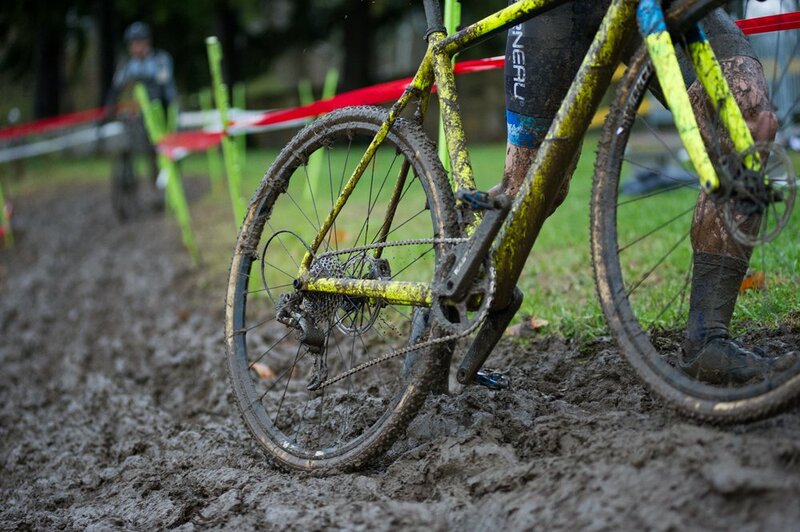 With lots of mud and deep puddles, the pits were a madhouse and the leaders were changing bikes every half lap. With such a taxing race, I found myself in no man's land fairly quickly. Moreover, my bruised thumb was still bothering me and made it particularly difficult to grip the bike. I did what I could to keep the bike upright but mentally I just was not in the game. 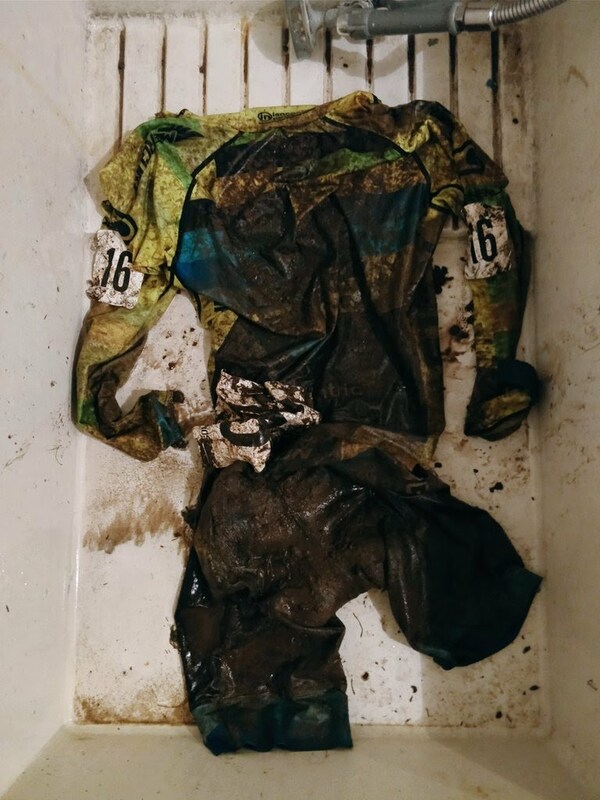 I carried on through the freezing water and mud to again finish one lap down in 18th place. Bottom Brackets will not survive. Further ahead, my teammate Michael van den Ham started the last lap trailing Gage Hecht (Alpha Bicycles) by 20 seconds. I was too cold to watch the finish, but the narration by Scot Herrman gave me the play by play. As both Gage and Mike left the pits for the first part of the lap, Mike was able to chase Gage down on the hillier part of the course. When the two reappeared passing pit two, Mike held a slight advantage over the young American. Fortunately, Mike had enough energy to hold off Gage and cross the line in first! Not a bad way to finish the weekend and represent the Canadian National Champs jersey, eh? Cold, wet, and tired, we packed up the bikes and headed back to the house. We washed off our muddy kits and headed out with the Beck family to a feast at Maggiano's. It was probably the fullest I had been in a long while, but it was definitely worth it and I got on the plane the next day still full with a smile on my face. Next up is the annual Ruts N Guts event in Broken Arrow, OK! I'm seriously looking forward to this event and can't wait to see what Mike, Tanner, & the crew have in store for this year's edition!